In the eyes of the law, the raising of children, and the maintenance of a standard of living adequate for their development, are the responsibilities of both parents, and fundamental human rights for the children. When parents separate or divorce, financial responsibility remains with both parents, regardless of where the children live, or with whom they spend time. In family law, the term “child support” refers to regular payments made to one parent by the other for the financial benefit of the children. Child support is often written into the divorce decree, or the child custody and visitation order. To explore this concept, consider the following child support definition. 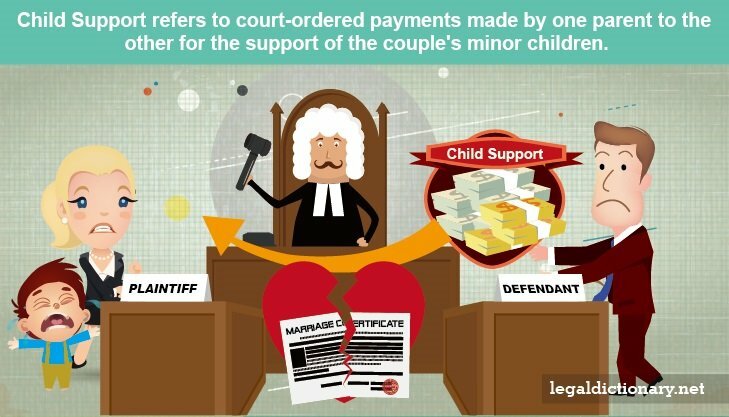 Noun Court-ordered payments made by one parent to the other for the support of the couple’s minor children. Child support specifically addresses the issue of financial support of the children, and is viewed as a separate issue from physical care, emotional and spiritual support, and the day-to-day raising of the children. When children live with both of their parents, there is no need for the courts to tell parents how to provide for them financially, but when the children live with one parent, or with neither parent, the parents are still responsible for their support. Child support payments are intended to help cover the costs of housing, food, clothing, and other basic needs, as well as school expenses, and other normal expenses of raising children. How much child support should be paid is calculated based on a formula set by the laws of each state. Support may be ordered to be paid by either parent, or in a situation in which the children are living with a third party or agency, both parents may be ordered to pay support. Each state has specific child support guidelines, though they are all based on federal law. Most states use an income-share method of calculating the amount of child support to be paid, and determining which parent will be making the payments. The formula takes into account both parents’ income, tax status, and other factors such as the need to support children of another relationship. The income of both parents is then added together, and a percentage of the total set aside for the children’s needs. The court utilizes a child support calculator to make these calculations. Using an online child support calculator may be used by parents to get an idea of how much child support might be ordered in their case. It is important to understand that the judge will ultimately take into consideration a number of factors in addition to income. Once this complex calculation has been made, the family court judge considers other factors, such as disparity in the parents’ incomes, whether an extremely high pre-divorce standard of living existed, and any other issues that would suggest a child support order should depart from the federal guidelines. If a non-guideline amount of child support is ordered, the judge must document that the order is in the children’s best interest. In addition to a monthly child support payment amount, many states make specific orders regarding the parents’ responsibility to share other expenses of child rearing. These may include healthcare costs, medical insurance, and childcare expenses, as well as educational costs and extracurricular activities. Because these costs vary, a set amount cannot be ordered and added to the child support payment. Usually, the parents are ordered to share these costs equally, one parent being required to provide the other parent with receipts or proof of payment or anticipated charges. Child support is most commonly paid by the non-custodial parent to the custodial parent, and is a separate issue from visitation. This does not sit well with many paying parents, especially when there is a disagreement or conflict about visitation with the children. In situations where the custodial parent withholds visitation, frustration and anger sometime drive the paying parent to withhold child support payments. Alternately, the custodial parent may withhold visitation because child support has not been paid. According to the law, neither of these actions is allowed. Parents cannot deny visitation or support to punish the other parent. The courts maintain that a child’s right to be financially supported surpasses a parent’s rights to object or engage in conflict. In fact, even if a parent decides he or she does not want to have a relationship with the child, the child’s right to financial support prevails. The rights and obligations of support and visitation are separate child support enforcement issues. Situations change, individuals experience medical emergencies, loss of income, or other issues causing economic hardship. If financial problems create difficulties making full child support payments, it is important that the paying parent notify the other parent, and the child support enforcement agency. In many cases a temporary payment plan can be entered into to prevent more serious consequences of non-payment. It is also possible for the child support order to be modified by the court. The paying parent must request such a modification of child support payments, showing there has been a change in circumstances, such as a decrease in income, change in the custody and visitation schedule, or unexpected expenses that caused economic hardship. If the court agrees that the change in circumstance warrants a change in child support, the amount will be re-calculated using the standard formula which takes into account both parents’ incomes and other considerations. At the time of separation or divorce, when a custody and visitation order is made, the court will also make an order for child support. A child support order may be requested at other times, however, as the parents need never have been married or lived together. While the exact procedure for obtaining a child support order, or a modification to an existing order, varies by jurisdiction, certain basic steps are common. File a motion, complaint, or application for child support order with the local family court. Parents may hire an attorney to help with this, or may use the standardized forms provided by the court to do it themselves. When the documents are filed, the court will issue a hearing date. Serve the motion on the other parent. This service of process may be done by a local sheriff, constable, process server, or another adult who is not a party to the case. Attend a hearing, where both parents will be required to provide information on their income, tax status, and expenses, as well as information on the children, custody schedule, and parentage if applicable. The court charges a fee to both parents for the initial filing, though parents with a very low income, or who are receiving public assistance, may obtain a fee waiver. This requires the filing of an application for fee waiver with the court, and provision of detailed income information. Many parents wonder how child support, whether paid or received, will affect their tax obligations. As far as the IRS is concerned, child support payments are outside the tax system for both parties. The parent making child support payments cannot deduct them for tax purposes, and the party receiving payments does not have to list them as income for tax purposes. This topic comes up when considering the amount of spousal support and child support to be paid in an agreement between the parents. The paying party may request to pay a larger amount of spousal support, and lesser amount of child support, the sum of which remains the same. This would benefit the paying parent, and be detrimental to the receiving parent, as spousal support is taxable. The paying party may deduct spousal support payments for tax purposes, and the receiving party must report spousal support as income for tax purposes. Because of these differing tax consequences of child support, both parties may benefit by consulting an attorney or tax professional before entering into an agreement. In most cases, the obligation to pay child support ends when the child reaches the age of majority, which varies in some states, from age 16 to 21, or until the child graduates from high school. In some states, child support may be ordered to continue after the age of majority if the child is attending college full time. Certain circumstances allow for early termination of child support, including the child’s legal emancipation, the child’s marriage, or death of the child. In the event child support payments fell behind at some point, and the payments have not been caught up by the time the order terminates, the paying parent must continue to make payments until the arrears have been satisfied. Custodial Parent – The parent given physical custody of the child for the majority of time. Wage Garnishment – The process of withholding a portion of an individual’s wages as repayment for a debt. Lien – A legal claim of a creditor or individual to sell the property of another person to satisfy a debt. Emancipation – The act of a minor freeing himself from the custody of parents or legal guardian, transitioning to adult life.